Seventy years ago. The day the world died. An affliction overtook the world. Power at a parasitic price. A new breed of humanity had emerged, humans infected by strange organ-like growths— Crests— that granted powers and corrupted the body. This emergence shook the balance of the world, and the world went to war. The year is 2090. The conflict had long since ended, and humanity’s numbers have devastated by war, congregating on their last bastions of survival, the few remaining hospitable regions left in the world. The Sectors. Of course, the war never truly ended. It only changed. Instead, the war continues through covert means— political machinations and terrorist attacks, mass surveillance and media control— and it rages on, organizations of all ideologies struggling for control. Under the veil of peace and the banner of restoration, humans and Espers continue their battle for dominance in the underground, a war to decide the future of a species. You are a Knight: an advanced class of Esper who has survived your awakening, seizing control of your powers, overpowering the parasite. It matters not how you became an Esper, be it through natural mutation or artificial creation; or why you fight, be it for power, pleasure, or an ideal to protect. Yes, we're doing this again. 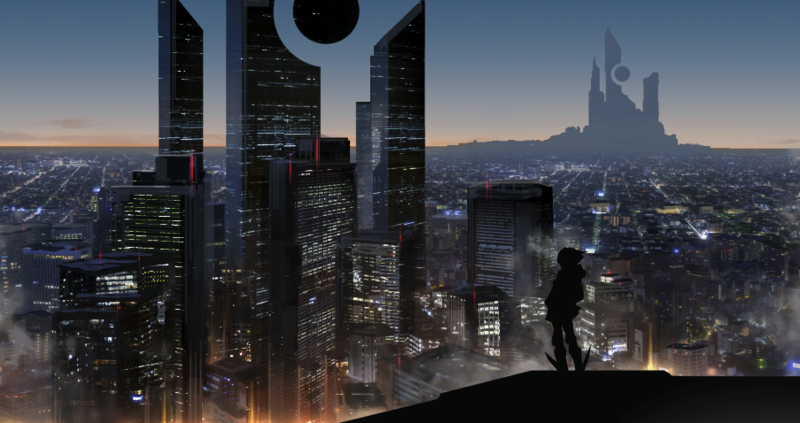 For those who weren't here last time, this is a reboot of a cyberpunk superpower RP, taking place in an original setting, based off a whole slew of of anime and games: Nasuverse, Darker than Black, Tokyo Ghoul, Ghost in the Shell, Psycho Pass, K Project, Deus Ex, and so on. The gameplay itself will mostly be a mix of PvP and PvE, though it wouldn’t be entirely combat focused, and stealth and social approaches are also viable. Compared to last time, it'll be a lot more free form. The setting itself revolves around Espers— this world’s flavor of superhuman. Espers are beings infected by parasitic pseudo-nervous systems called Crests, that add to and alter the functions of the body: setting it ablaze, hardening it steel, allowing for the control of water, and so on. You play as a Knight, an advanced class of Esper who can manifest a weapon called a Regalia. The Crest is essentially an organ, and can be transplanted, grafted, and surgically removed. Espers can consume the Crest of other Espers, to absorb their powers or to increase their own. This is the primary way for Espers to increase their powers. The Crest corrupts and consumes the body— an affliction known as Blight— which strengthens the Crest, but in turn drives the host to insanity, until they are turned into a monster. As for powers, you choose from a selection of basic varieties, called Strains, to pull off more complex actions. For example, if you wanted to shoot blades like a railgun, you could do so by using a basic metal manipulation and electricity manipulation Strains in tandem. The one thing that does make Espers unique from each other is that they can manifest an extension of their body based on their psyche, called a Regalia. This can be a weapon like a blade or arm cannon, or other things like wings, exoskeletons, visors, and so on. There are thirteen powerful Espers known as the Kings, who can infect other humans with their Crest. You can choose to be subject to a King, and in exchange for your loyalty, you gain a portion of their power, though your body and mind are left at the King's mercy. As for the world, the game takes place in a war torn Earth, in which the world was torn apart in a war between Espers and Humans. Much of the Earth has been left uninhabitable, and the remnants of humanity have congregated into city-states, called Sanctuaries. Sector One, the first Sanctuary and the forefront of humanity's reconstruction, is located in what used to be the Nile Delta, a former warzone turned shining metropolis. While the war has formally ended, Espers and Humans fight for dominance in the underground. For character creation details, and more setting information, see the Rulebook. Or: What changed from last time? Instead of HP and Blight being numbered values, they're more like ranks or stages. For example, stages of Blighting, or "you can take X many Wounds before going down"
See the rulebook for details on character creation, make your sheet according to the template, and PM it to me. There are sheet templates as well as some example sheets on the bottom. If you need help creating your character or finding a way to fit it to the system, you can ask me for help. If you show me your sheet early, I will only give you honest, blunt feedback if you ask for it; otherwise, I will refrain from making comments. I will accept six people, two from each major faction. Sheets will mostly be chosen based on quality and how interesting I find them: character backstory, powersets, and so on. I will also try get in players who aren't in any other active RPs. The application deadline will probably be in two weeks, 7/23, though I can extend if circumstances allow, or if interest peters off and we get enough players, we can start early. If you have questions, I'm available over Discord, IRC (#regalia), or plain old BL PMs. Don't message me on Skype, I will not see it. Q: How many sheets can I send? A: As many as you like. I'll only pick one though. Q: Can I submit NPC Sheets? A: If you like. These will be much more likely to get in, but I'll have to approve of them first, and I may or may not use them. Q: How many Strains can I have in a single part of the body? A: As many as you wish. The maximum amount is determined by the substrain cap. Q: Can I resubmit characters from last time? A: Yes. Be sure to adapt your previous system to the current one. Q: If I got in last time, will I get in now? Q: What does the Symbiotics talent do? A: Taking a talent in Symbiotics is not required to be proficient in the use of your Crest, unlike the other talents. Instead, it indicates exceptional talent with certain aspects of controlling your Crest, be it a certain Function that you're the most talented at, or things like resisting or controlling Blight. Q: How does allocating Strains to body parts work? A: You can allocate multiple Strains to a single body part: for example, putting multiple substrains in your head or arms. Also, a single substrain can correlate to multiple body parts: for example, you can allocate a single substrain to both of your arms, or both your legs, instead of needing to take a substrain per limb. Last edited by Kirby; July 26th, 2017 at 11:32 AM. Part of me wants to reboot...whatever my char was called for this. The other part reminds me it wont be the same without my husbando Velyoukai. ...hmmm...I wasn't able to stay with it last time, but I regretted that later. Maybe I should rectify that mistake? Is blighting affected by intelligence or willpower? Because the rulebook says INT but implies WIL. Derp, that was something I forgot to change. It's WIL. So, the Concentration Strain doesn't exist anymore? Oh, I think I forgot to port that over. Adding it back in. [01:05.15] <@Spinach> I can flash gang signs faster than Sasuke can perform ninjutsu and I rap like Medea's High Speed Divine Words. I can read it fine on mine, but that might be because it opens in Docs for me. Is it for you, or is it opening in browser or something? Also, are exactly two people going to be selected from each faction? Last edited by Draconic; July 10th, 2017 at 04:02 PM. You're more likely to get in than me. All I've got is survivor's guilt and a hero complex... actually that's pretty typical of my characters, with the sole exception being my Kancolle fake Bismark.